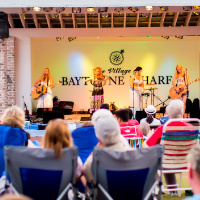 Located along the shores of the Choctawhatchee Bay in Northwest Florida, The Village of Baytowne Wharf features an array of boutiques, eateries, galleries and nightlife -- not to mention a jam-packed schedule of outdoor festivals and special events for the entire family. This spectacular setting, all within the gates of Sandestin Golf and Beach Resort, is the perfect spot to spend a vibrant afternoon, evening, week, vacation, or you can be one of the lucky few who frequently experiences Baytowne Wharf through home ownership. The Wednesday Night Concert Series returns to Baytowne! This spring sit back and relax, as you take in the cool crisp air, and enjoy live entertainment. The concert series will feature both local and regional talent from a variety of genres. Concert begins at 7pm on the Events Plaza Stage.